More than a plan, a commitment! The forest management with responsibility and focused on natural resource conservation is one of Veracel’s main and non-negotiable commitments. We go beyond the law compliance and consider our Integrated Management Plan as foundation of all our activities. The management is carried out in the company’s areas where the planted forests, the conservation areas with native vegetation, rivers and lakes are located, among other structures. It aims to ensure the environmental conservation along with, of course, the sustainability of the business, which is closely linked to the quality of the company’s forest areas. This document’s review is made annually or as needed, according to the results of the monitoring, significant changes of activities, socioeconomic or environmental responsibilities and conditions in the region where we operate. Currently, most of the population of the region surrounding Veracel resides in urban areas. 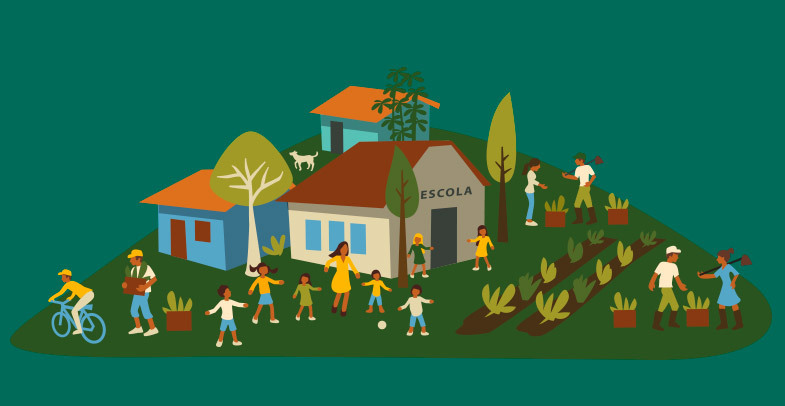 The level of income per capita is lower than the average in the South of Bahia, and the structure of sanitation and health services is not sufficient to meet all demand. The regional natural features favor the development of plants throughout the year, mainly due to the average annual temperature at 24ºC, with small amplitude and good distribution of rain. As for the physical environment, the region is marked by coastal plains formed by large plateaus separated by valleys, with altitudes that reach 100 m and descend gently toward the coast, forming cliffs and dead-cliffs. Our plantations are situated in 10 municipalities (http://dabahiaparaomundo.com.br/por-dentro-da-veracel), with an average transportation distance of around 60 kilometers from plantations to the industrial unit. Within the licensed area, a number of socio-environmental constraints determine the location and limits of planting by municipality. 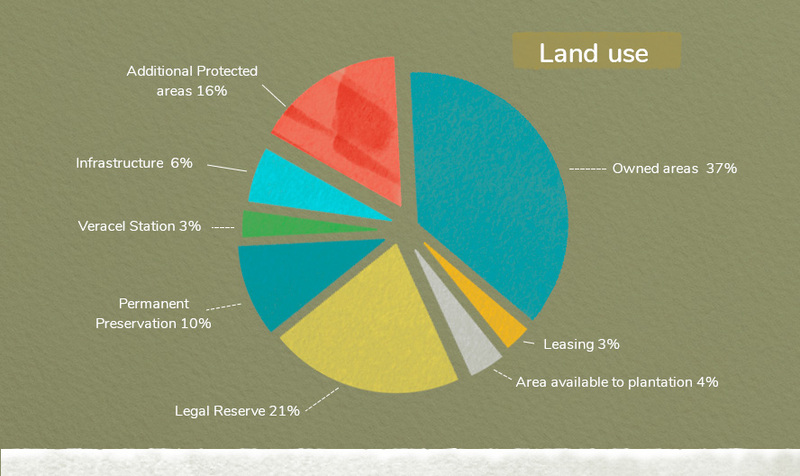 The land (planting, protected areas, roads, streams, rivers and other uses) is used responsibly and monitored by the Veracel’s cartographic base, which also archives maps with spatial distribution of all the forest typologies composing the Legal Reserve areas, Permanent Preservation areas and Veracel’s Additional Protected areas. Like any other Veracel’s strategic activity, the foundation for management is the planning. 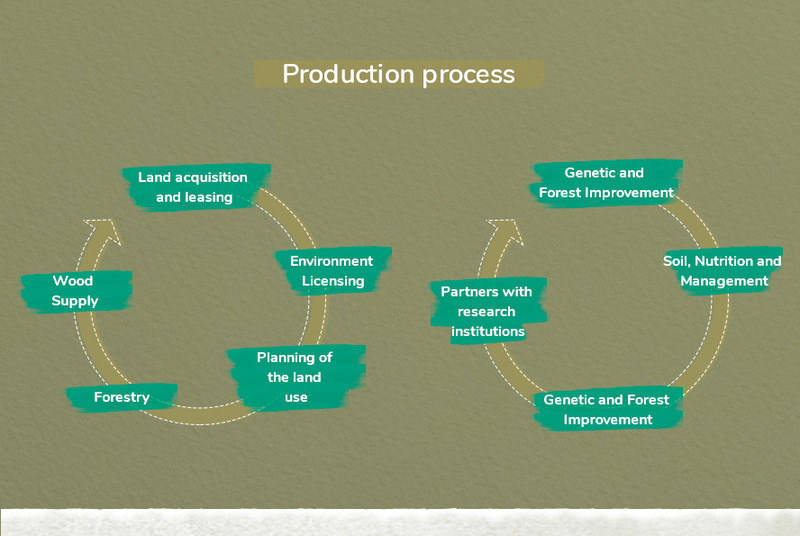 The process has long, medium and short-term actions as well as technical, economic, environmental and social projects (PTEAS, in Portuguese acronym). Taken together, these instruments indicate how much, when and where to plant and harvest planted forests, in addition to preview the required investments. For example, a wood supply and planting program (see table below) was designed to increase the industrial unit’s production to 1.2 million tons of cellulose per year by 2021. * It includes wood from Produtor Florestal program and third parties. 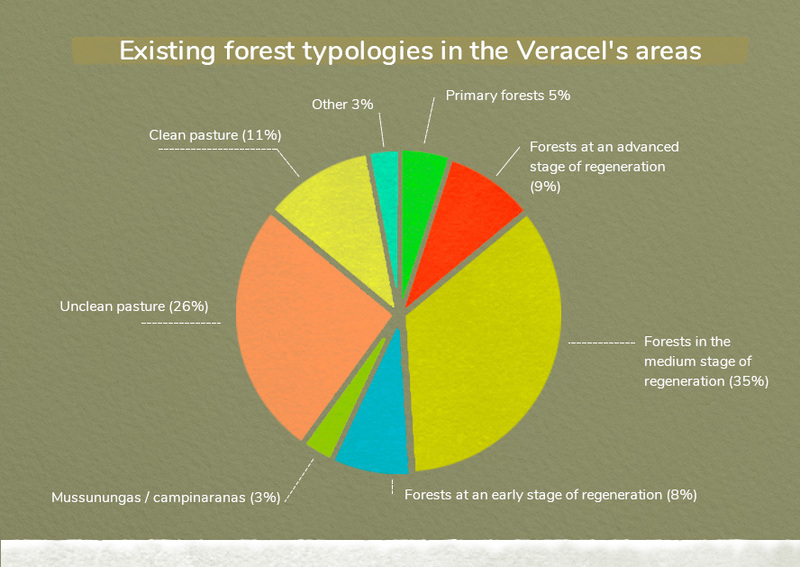 In order to support the forest planning, Veracel carries out a Continuous Forestry Inventory. It allows us to develop models able to estimate the current and future forest volume and establish the growth rates. The inventory starts when the forest is two years old, with the installation of permanent rectangular plots. After some studies and analyses, we have decided to expand the plot size. So, the plots have contained 33 trees since 2016. The plots are measured annually up to one year before the harvest, and the sampling intensity is a plot for each 15 hectares, Additionally, we carries out a Pre-cut Inventory at most three months before the harvest and with a sampling intensity of one plot for every 3 hectares to ensure better management of areas to be harvested. The Veracel’s forest productivity has reported falls in recent years, especially due to the weather conditions. The current value is about 41 m³/ha/year (in shell) for the first cut, corresponding to a wood volume of 290 m³/ha at the age of seven. 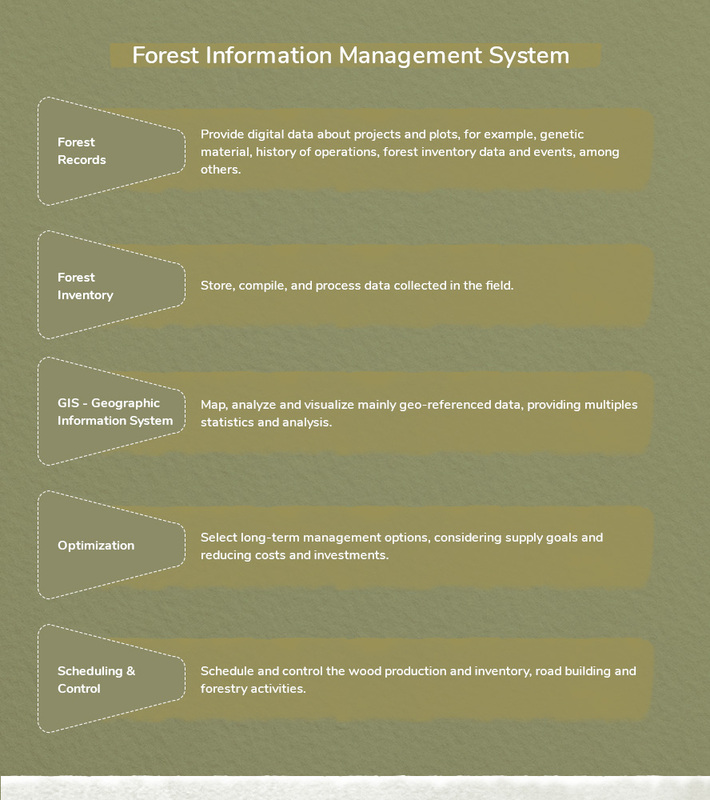 In order to support and implement the forest planning, Veracel uses a number of information systems and analytical tools distributed in different modules or subsystems composing the Forest Information Management System. Researches and experiments are important allies for increasing forest productivity. 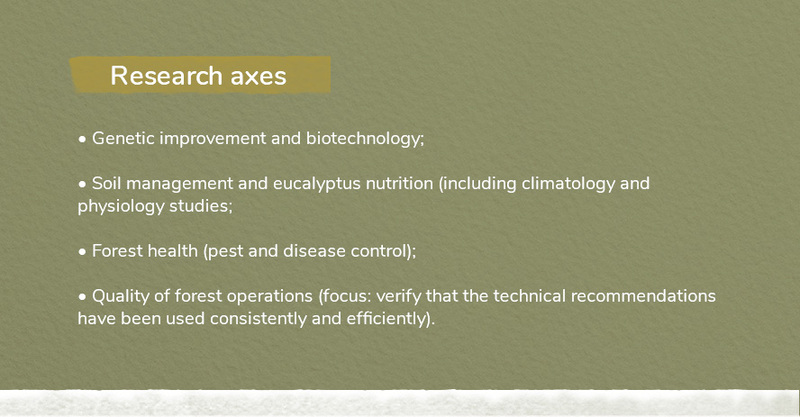 At Veracel, we invest in four main lines of research. The work is developed within a multidisciplinary context, including external partners such as universities and research institutions. 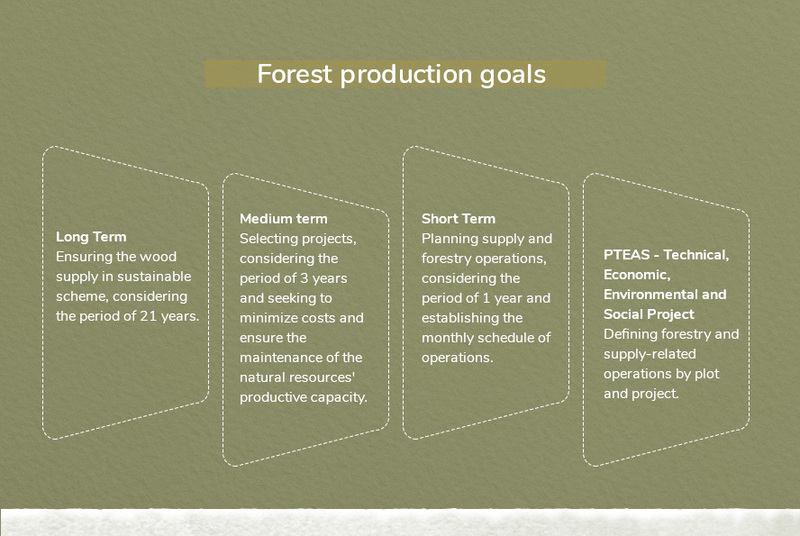 Our forest operations are divided into three areas: Forestry, Wood Supply and Produtor Florestal Program. Every activity follows the strictest occupational safety and health standards defined by the respective Veracel’s management program. This process also covers service providers, which must follow the same guidelines and procedures expressed in the Occupational Safety and Health Management handbook for Veracel service provider partners. Besides guiding and monitoring, we do periodic inspections to ensure that the employees’ health and safety are always priorities. The Veracel plantations are 100% formed by eucalyptus clones obtained from the crosses of the Eucalyptus grandis and Eucalyptus urophylla species. Eucalyptus is a highly adaptable species to the regional environmental, soil, climate and biodiversity conditions, besides having high productivity and regrowth capacities. Seedlings are produced by the minicutting method in an own nursery located in Eunápolis, with capacity to produce up to 24 million seedlings per year. Veracel also acquires seedlings from third parties to complement the plantations. The planting technique used is the minimum cultivation, which aims to reduce the impacts on the soil as far as possible, protecting it against erosion, keeping its moisture and preventing the silting by watercourses. After planting, the first-year management activities are started, including leafcutter ant control, pre-emergent chemical weeding, chemical weeding in the planting lines, brushcutting and top-dressing fertilization (12 months after planting). After the first year, the forest maintenance phase begins and continues until the extraction of the wood produced. During this period, the monitoring of leafcutter ants is carried out by skilled teams every six months, plot by plot. According to the infestation and economic damages found by the monitoring, control recommendations are produced, specifying types of combat (direct or systematic – bait holder (MIPIs)) and the dose of formic baits based on sulfluramide per hectare (kg/ha). This monitoring’s purpose is optimizing the ant control product use by adjusting the dose to the minimum required for each plot. The pre-emergent chemical weeding operation, which uses Sulfentrazone or Isoxaflutole in the planting line or in the total area with the purpose of preventing the germination of monocot and dicot weeds present in the applied area, can be held up to twice after the first application (45 and 90 days after planting). Two pre-emergent chemical weeds are carried out, on average, after the first application. The post-emergent chemical weeding operation, which uses glyphosate as an active principle, is performed when an infestation of weeds, competing with eucalyptus for water, light or nutrients, is observed. Two chemical weeds are carried out, on average, in the total area during the first year of planting, however, we can choose to brushcut the total area, depending on the size and type of weed. Soil and water analyzes are carried out periodically to identify the potential presence of the active principles in these environments. The Wood Supply area is responsible for the construction and maintenance of roads, harvesting, loading, shipping and handling in the log yard and machinery and equipment maintenance. Due to the importance of these activities’ costs for the total cost of wood delivered to the factory, the correct planning and the operation quality are crucial for our economic viability. Similarly, the environmental aspects are relevant, which means that operations must include measures to minimize potential impacts on the environment, such as soil erosion and changes in the water quality. Impacts on residents and communities in areas close to forestry projects are also considered, since the transport operations involve noise and power generation as well as increase the risk of accidents, demanding mitigation measures. The Veracel’s Produtor Florestal program is based on the practice of planting eucalyptus in partnership with landowners for supply of part of the wood consumed at the factory, which represents a new opportunity to income diversification in the region. The plantations under this modality of wood production should fit to the principles and criteria of FSC® and Cerflor standards for cellulose production. Through a pre-contract for wood purchase and sale, Veracel finances the forest formation and maintenance costs and provides, as an incentive, improved clonal seedlings and technical assistance for each producer. The producers’ commitment to future wood sale is based on contractual assumptions considering, among other things, the environmental and labor legislation compliance. 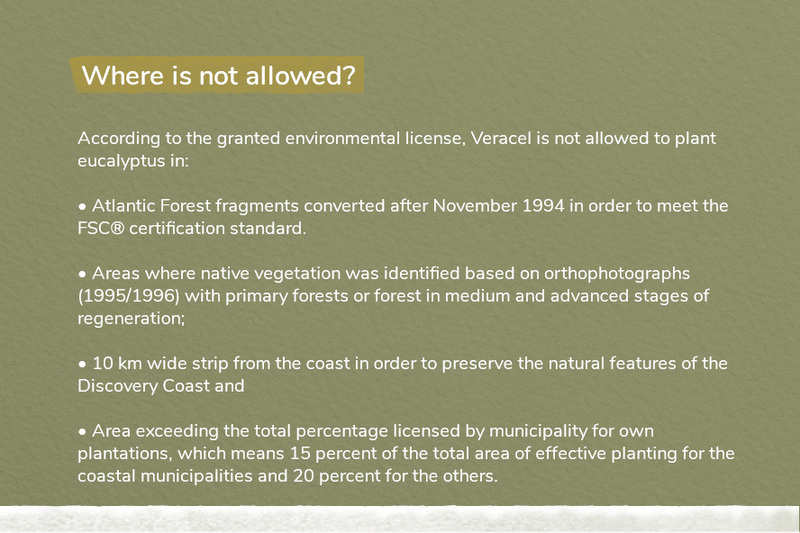 Veracel requires that the producers provide the prior environmental licensing for forestry activity, which includes the compliance with the existing legal parameters. It is the owner’s prerogative to define the destination of 3 percent of the total wood produced, which may be sold in the local and regional markets, contributing to the use of wood in other economic activities in the region. Aligned with our environmental commitment, we follow the best forest management practices in order to maximize the positive environmental impacts and minimize any negative impacts. 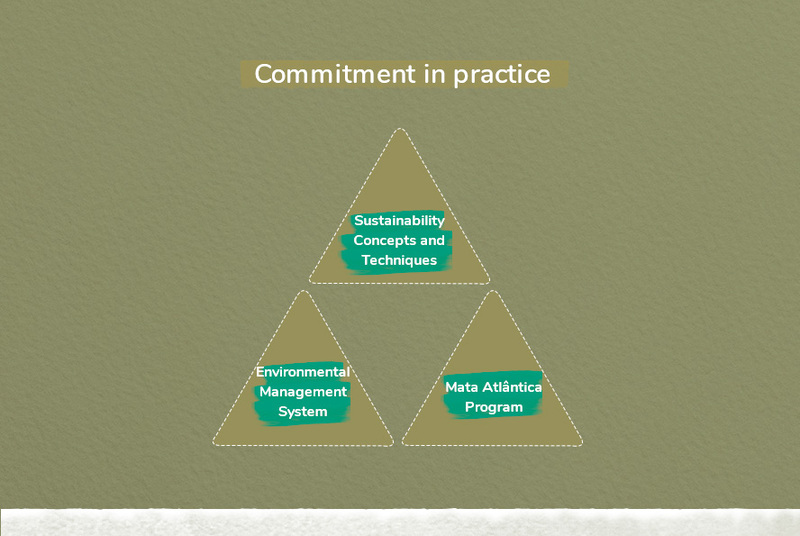 With this purpose, we direct our actions to strengthen sustainability concepts and techniques, the Environmental Management System and the Mata Atlântica Program. Based on our environmental management system, we conducts a series of control and monitoring, all essential to the maintenance and improvement of environmental conditions in the region where we operate. For example, we monitor the Area of High Conservation Value (AAVC, in Portuguese acronym), the Veracel Station, environmental, fauna and flora, soil/water indicators. The Veracel Station – EVC (in Portuguese acronym), with 6.063 hectares of well preserved forest area and located at 15 km far from Porto Seguro, is one of the largest private Atlantic forest reserve in northeastern Brazil. Recognized by IBAMA as a Particular Reserve of Natural Heritage (RPPN, in Portuguese acronym) in 1998 and by UNESCO as a World Natural Heritage Site (SPMN, in Portuguese acronym) in 1999, EVC is aimed at activities of biodiversity conservation, water resources protection, research, environmental education and interpretation. The Veracel’s Social Management model includes the internal and external stakeholders and aims to build high quality relationships with them. We want to be always in tune with the legitimate needs and interests of all, considering their significant interactions with social, economic and environmental issues. That is why we invest in some continuous processes of engagement and relationship with the communities. We maintain close and transparent relationship with the communities near our operations, with specific dialogue channels for each one. Our care is even greater for those located in areas within a radius of 300 meters from the limits of the eucalyptus plantations (own and leased lands) and along the local and state roads used by Veracel for the wood transport to the industrial unit. The same applies to the traditional communities, such as indigenous peoples. Veracel and Produtor Florestal program have not plantations in legally demarcated and recognized indigenous areas. All of them are fully respected. We also monitor the social activities! Just as we follow closely the technical, economic and environmental aspects, we also evaluate the social aspects arising from our business in the region. We are committed to local hiring, community development, generation of shared value, the best working, safety, health, feed and transport conditions for employees, team development, active dialogue, management of the Contact Us channel demands, the tracking and promotion of the Produtor Florestal program, among other elements. If you have questions, criticism or suggestions or miss some information about our Integrated Management Plan. Please fill out our Satisfaction Survey. Complaints? Use our toll-free number: 0800 721 0764. 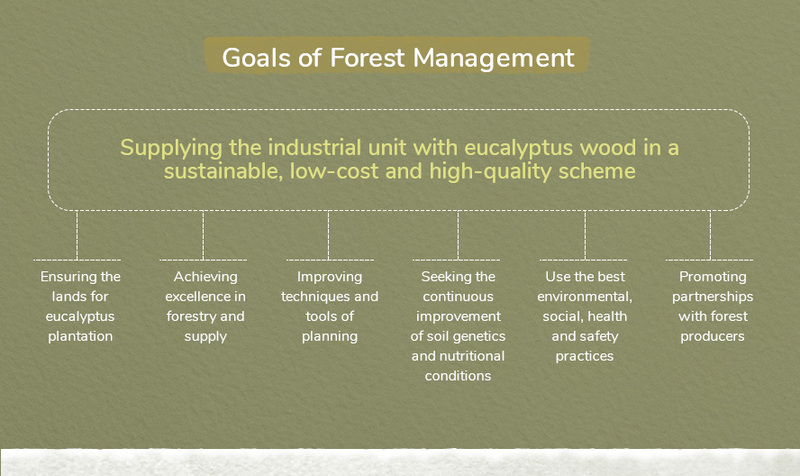 Learn more about concepts, techniques and procedures adopted by the forest management that allow us to be sustainable. Integration with educational and research institutions and NGOs for development of projects in forest and environmental fields. Road construction pattern at the crossing of valleys and slop hydro-seeding in the roads.